My middlest has turned 2 and since she’s our little monkey we chose to make her a DIY Curious George Themed Birthday Party. Of course she loved it! It was fairly easy to do and the results were perfect. 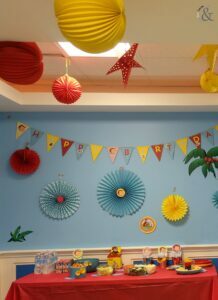 Themed birthday parties are a lot of fun to create because you can do as little or as much as you’d like. Just begin with an idea and see where it takes you. 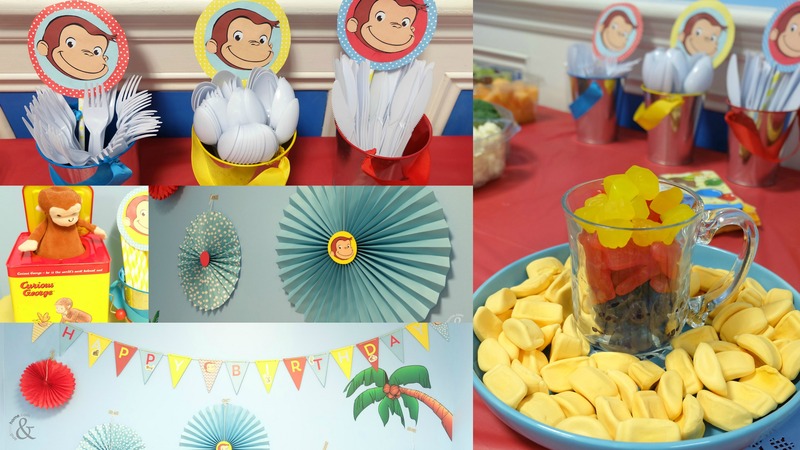 If you have a little monkey in your life and you’re looking to create a Curious George Party, then take a peak below for some awesome ideas! We chose to use the primary colours of the show, which is a great pointer for any themed birthday party. Curious George’s colours seemed to be red and yellow with splashes of blue. Fortunately, decor for these colours are readily available at most dollar/party stores. Plates, cups, cutlery and napkins can all be purchased in these colours. 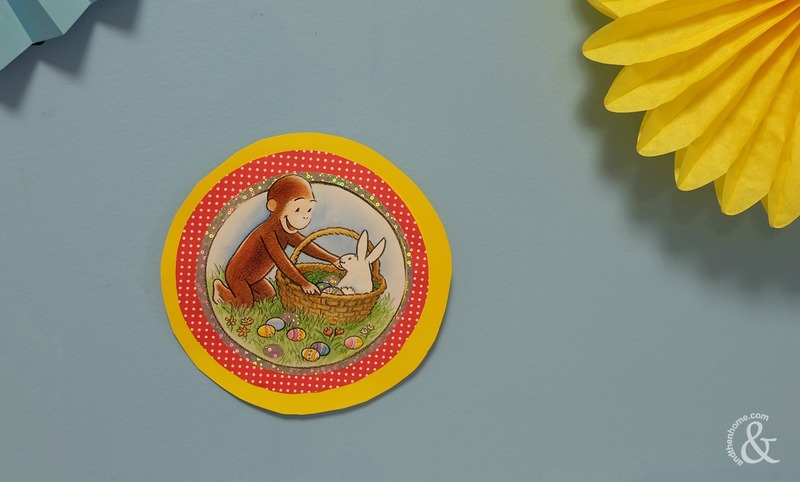 You can always order specific Curious George plates from Amazon or find them at a local party store, but it’s not always necessary. 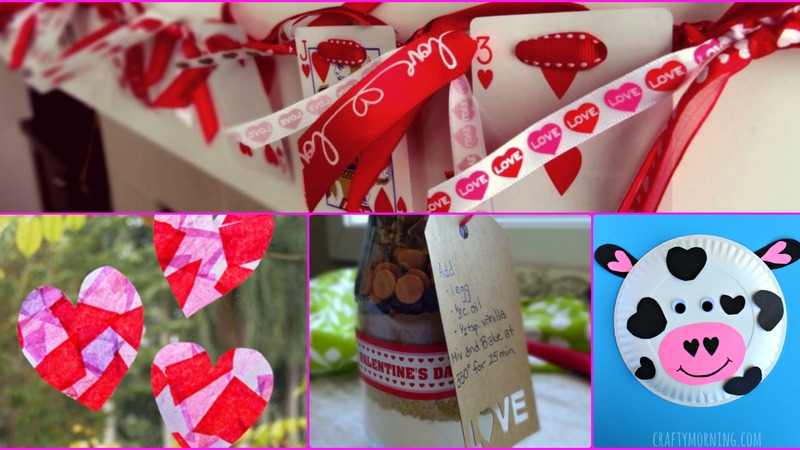 The decorations were very easy to make and as you can see from the pictures, very impactful! 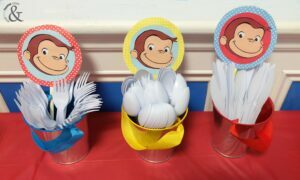 We bought some construction paper (in the required colours of course) to use behind some pictures of Curious George we printed from the computer. Some of these we taped to the wall and some we taped to some bright coloured paper straws which we put in the cutlery tins. The cutlery tins themselves were an awesome find! The tins had bright coloured handles that matched our theme and were found in a local craft store. 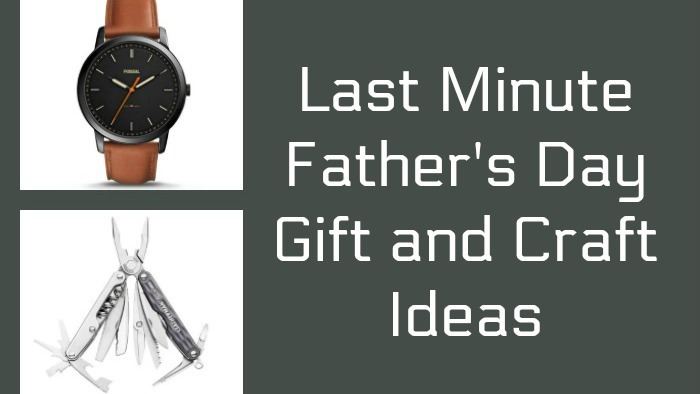 Don’t forget to check out any second hand stores! 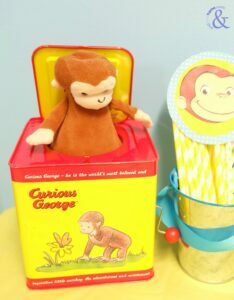 We scored big when we stumbled upon a Curious George ‘jack-in-the-box’ (update – Amazon has these too! Check out the link below*). Some other things to search for in second hand stores are pictures, frames, dishes and toys. You never know what you’re going to find. 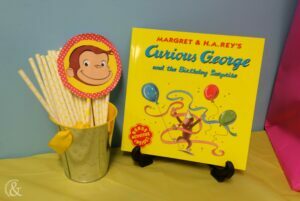 We also ordered a Curious George birthday book from Amazon which we displayed using a plate stand. Colours and Characters – DIY Party Theme Pointer Success! 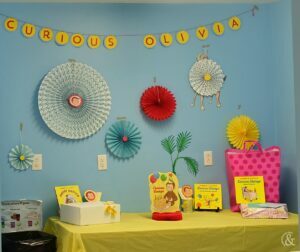 We also used some blue, yellow and red party decor fans. These were found at a local craft store, to add some monkey theme to it, we added a picture of George in the centre of the fans. 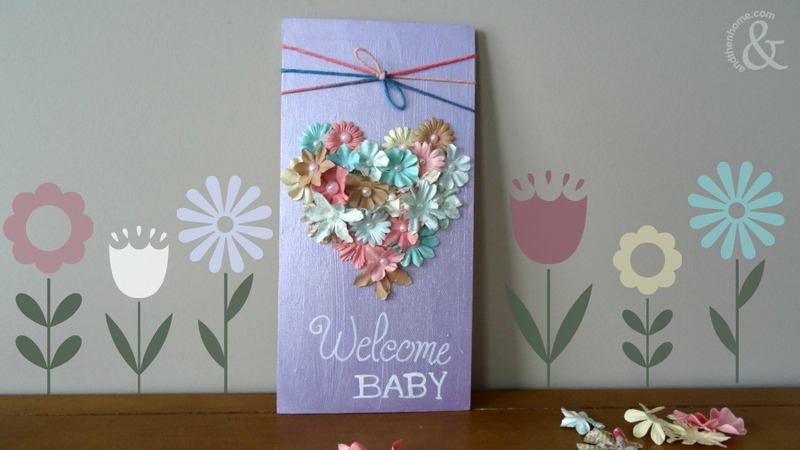 One of my favourite parts of the decor was our banner, which was another DIY project. We bought blank banner triangles and added sticker letters to spell “Curious Olivia” which was the birthday girls name. Finally, the food. 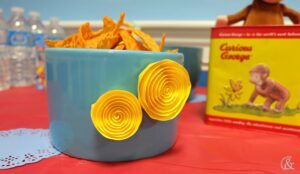 We provided your regular party food favourites in theme coloured bowls. Our creative touches were in some candy. We had some banana candy fit for any little monkey and a dish of themed coloured candy to top it off. 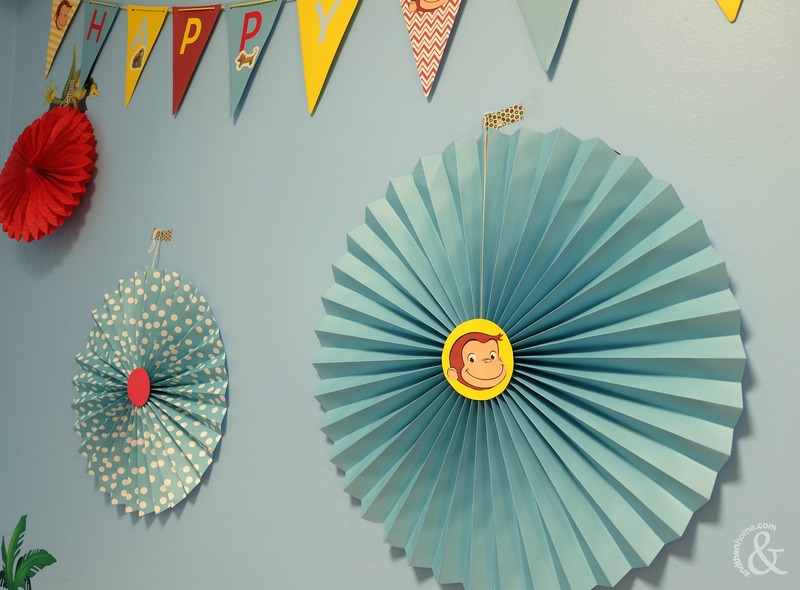 I hope this helped give you some inspiration for that Curious George Themed Birthday Party you want to give your little monkey! 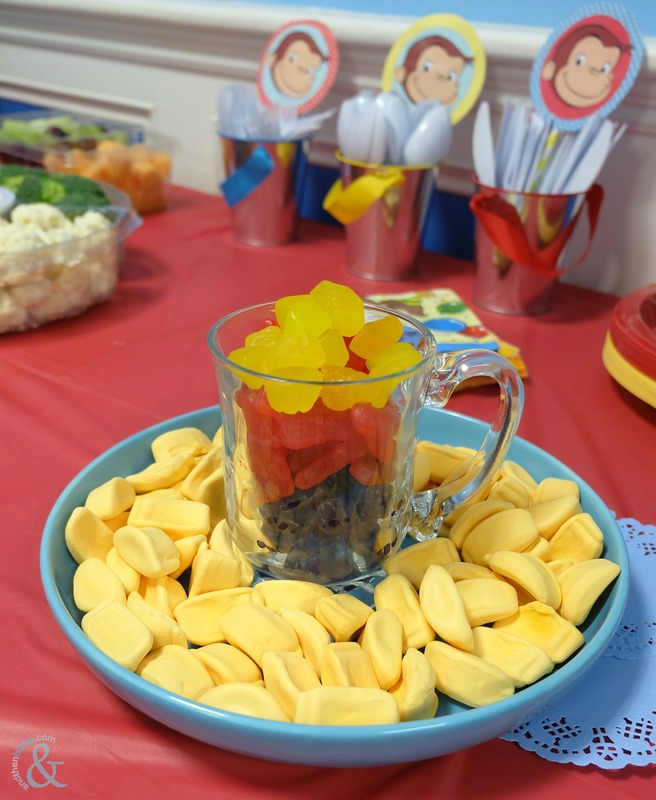 If you’re looking for some favour ideas check out these DIY Mini Candy Favour Jars or grab some Curious George themed scrapbook paper and take a look at How to Make Favour Boxes from Scrapbook Paper.